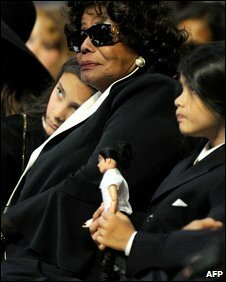 Michael Jackson's mother Katherine will become the permanent guardian of her son's three children, a Los Angeles judge has ruled. The 79-year-old has been caring for Prince Michael, 12, Paris, 11, and seven-year-old Prince Michael II since the singer's death on 25 June. The ruling follows an agreement with Jackson's ex-wife Debbie Rowe, mother of the two eldest children. The pop star nominated his mother to raise his children in a 2002 will. In a surprise move, a lawyer for Jackson's dermatologist, Arnold Klein, tried to enter objections to the parenting of Jackson's children at the hearing. Lawyer Mark Vincent Kaplan said Dr Klein wanted to "have a voice" in issues concerning the children's "education, healthcare and welfare". But Superior Court Judge Mitchell Beckloff quickly dismissed the claim, saying Dr Klein did not have any legal standing. He added that the dermatologist would have to file a formal request if he wanted to challenge the agreement. Dr Klein's objection is likely to stir up fresh speculation following tabloid claims that he is the biological father of Jackson's two children with Rowe. His lawyer told the judge that biology was not the reason for his client's concern. "Legally, he is not a presumed parent," Kaplan said. Appearing on CNN's Larry King show last month, Dr Klein was asked about the paternity claims and replied: "Here's the most important thing. Michael loved those children as a father. Those children loved him as a father. As far as I am concerned, that's the most important grouping that is." During Monday's hearing, Mrs Jackson was also granted a monthly allowance from her son's estate, which is believed to be worth $500m (£300m). The amount was not disclosed, but the judge ordered the allowance to be applied retrospectively to June. It will be reviewed after six months. Jackson's children were also approved a monthly allowance, which will be reviewed after the same period. Although that amount was also not disclosed, the judge only granted 83.5% of what lawyers had requested. However, he noted: "It is not my intention to deprive the kids of anything that they're entitled to." Ms Rowe is the biological mother of Jackson's eldest children, but she gave up custody rights to the pair following her divorce from Jackson in 1999. The former nurse later applied for her access to the children to be reinstated, reaching an agreement with Jackson in 2006. Under the new custody agreement, Ms Rowe will have visitation rights with the two oldest children and will continue to receive spousal support payments. Lawyers for both parties said no money had been involved in reaching the agreement with Ms Rowe. Her lawyer, Eric George, said the agreement "eliminates uncertainty" over the children's future. 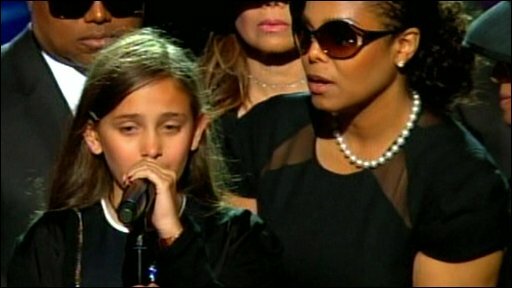 The singer's youngest son - Prince Michael II, known as Blanket - was born to a surrogate mother whose identity has never been revealed. A further hearing has been scheduled for 2 October to "review the circumstances of the children" and ensure the custody arrangement has been successful. Judge Beckloff also approved Jackson's will, which named two music industry figures, John McClain and John Branca, as co-executors of the singer's estate. To date, court records show the men have recovered some of Jackson's personal belongings, $5.5m (£3.25m) in cash and the singer's life insurance payout, all of which will end up in a private trust account. Beckloff said he would consider Mrs Jackson's motion on whether she can disqualify McClain and Branca from administering the estate on grounds of their capacity or potential conflicts of interests. He has given her until 2 October 2 to come up with reasons why she should have greater input. Concert promoters AEG, who were behind Jackson's planned 50 London concerts, also filed papers asking to be named a party to estate hearings and to be kept informed of business decisions. Jackson's autopsy results and cause of death are due to be released this week.